Home > Blog > Resorts with great Après-Ski! While there are some good places to stop at on the slopes before heading down on your last run of the day, things really get going before dinner for the traditional Italian aperitivo when the smart cafés and bars around the town fill with people sipping prosecco, aperol spritz and other pre dinner drinks. There are some excellent fine dining choices, with three Michelin starred restaurants (the most of any Italian Alpine resort) and some other, more affordable options. Post dinner there are a few exclusive bars and clubs that usually get busy after midnight, often tables are available by reservation only. Madonna di Campiglio is more expensive than other Italian resorts but there are some more affordable places to eat and drink tucked away around the town. There’s plenty for non-skiiers alike, with other activities including open air ice skating, husky dog sledging, snow shoe excursions, and even paragliding. Explore the historic town centre, with its medieval churches, upmarket shops, café bars and restaurants. For those who are interested in history and the local area there is the civic museum and the mineralogical museum. A visit to the Bagni Vecchi (old baths) or Bagni Nuovi (new baths) spa is a must, you can spend the whole day there or just go after skiing one afternoon and soothe aching muscles. There are a number of good restaurants around Bormio, from rustic family run restaurants offering traditional local fare, to more refined choices (including one with a Michelin star), and of course a number of pizzerias. Other activities include ice skating, husky dog sledging in nearby Arnoga, night skiing once a week, swimming at Bormio Terme, snowshoe excursions, cross country skiing, the Bernina train to St. Moritz, and much more. Chatel is just a stones throw from the Swiss border, set between Lake Geneva and the Mont Blanc. It's a charming haut-savoyard village at 1200m and has remained true to its traditions. You will find shops, restaurants, bars, nightclubs, a cinema and bowling alley. There is also a nightclub called Le Sloopy's opened from 12pm to 5am with 2 floors of 80's music and general music. There are a number of other activities available in the resort if you do not want to ski. 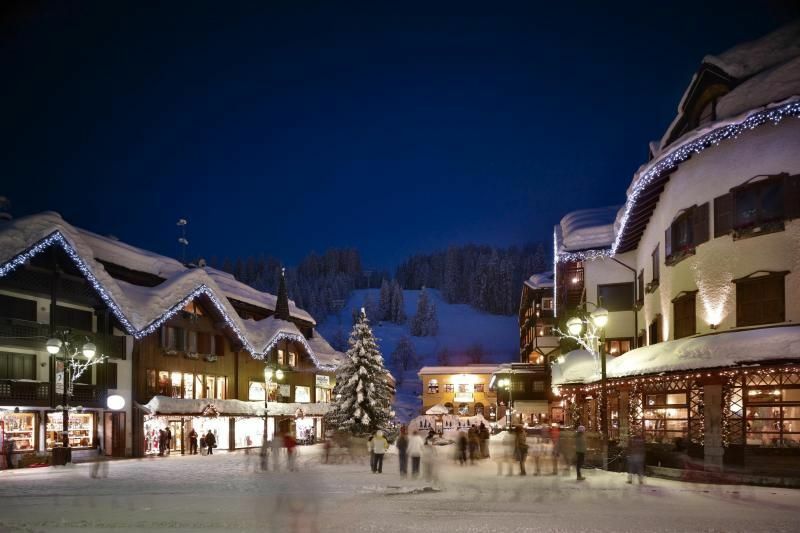 Why not explore the 12km of cross-country skiing tracks or snowshoe around 40km of marked paths in Chatel which is linked with Morgins in Switzerland. There is also an ice rink, wellness centre, paragliding, ice fishing, evening skiing and sightseeing train. Wildzeit Bar in Flachau - schonzeit-flachau. There is a fantastic choice of après ski in Flachau, from après ski bars on and off the slopes offering DJs and live music, to bars, restaurants and other venues, nightlife here is varied and lots of fun. If you want a destination for a New Year’s ski break then this is it – although you’ll need to get in early as hotels in the area book up pretty quick! Wildzeit après ski bar is a great choice with revelers in the area! There are so many activities on offer for all ages, including tobogganing, snow tubing, sleigh rides, curling, night time ski and snowshoe excursions and much, much more. The Amadé spa on the outskirts of Flachau is also worth a visit with waterslides and wave pools for children and swimming pool, saline pools and spa area for adults. Bansko (936m) is located at the foot of the Pirin Mountains in southwestern Bulgaria. In the last few years the resort has enjoyed a great deal of investment, building new hotels and resort facilities, making it Bulgaria’s top ski resort. Bansko offers great Après Ski with over 100 'Mehanas' to choose from. Mehanas are friendly taverna style restaurants serving traditional Bulgarian cuisine and drinks, often with roaring log fires and live music and entertainment. There are a few après ski bars around the gondola station in the town and bars and nightclubs are open until the early hours. Happy End and Sing Sing piano bar are among the more popular nightlife venures. There are also a number of shops and good value restaurants around the pretty town centre. Other Activities in Bansko include: ice-skating, swimming, bowling, snow shoe walking, cross country skiing, snow mobiling and ice fishing. We have ski destinations with good après-ski that will fit all budget and capabilities. If you like the sound of one of these locations, then get in contact with us today for your tailor-made quote, just drop us a line.